Words in the Dust by Trent Reedy. Arthur A. Levine Books, 2011. Currently available. Face Value: This cover isn’t the most gripping that I have seen among middle grade novels this year, but I do appreciate it for its accuracy. We get a sense of place from the cover image (the isolated desert area where Zulaikha lives) and we see Zulaikha’s face before her surgery. I actually don’t mind the covered face because it reflects Zulaikha’s culture and her mannerisms before she had her cleft lip repaired. I’m not so much a fan of drawings as book covers, and at first I wished that they had photographed a model for this cover – but then I realized how dated that photograph could quickly become. This drawing captures the spirit of the character and will look good on a shelf for years. From what Reedy writes of the real Zulaikha who inspired this story, there is true Slatebreaking spirit and intent behind this novel. Zulaikha is a girl who will quickly find a place in your heart. But there’s an issue that prevents me from calling this a completely Slatebreaking novel…more on that after the jump. Who would we give it to? This is tough. It’s not a feel-good, pleasant book. Zulaikha experiences far too much tragedy than any young girl should have to deal with, and it has a high “Kleenex quotient” (there are scenes that will make you burst into tears). It’s not exactly something that you can blithely recommend as a fun read. Honestly, I think this would be a thought-provoking book to share with young people who have family and friends serving in the Middle East. It would certainly start a discussion about cultural difference. Review: I was initially very skeptical about Words in the Dust. How could a white, male, U.S. American soldier tell the story of a young Afghan girl and make it and compelling? Was there any way that this author could tell this story without imposing his exceptionally different lifestyle and values onto Zulaikha’s story? Would it glorify U.S. military presence in Afghanistan? I began this book expecting to dislike it. Now, however, I must admit that I was not giving it a fair chance. I realized that I was wrong about halfway through, when I had to stop reading to get some stuff done and it made me really grumpy that I couldn’t just devour the book in one sitting. I wanted to keep going because I felt so invested in Zulaikha’s story. The author’s note and appendices at the back of the book make it clear that Reedy devoted a lot of time to researching and writing this book, so that he could honor the real-life inspiration with a strong story. Zulaikha was born with a cleft lip and endures perpetual criticism and teasing from the neighborhood boys, and occasionally even her own brothers. Her mother, who was once very active in literary and academic circles, was murdered by Taliban extremists – and Zulaikha saw it happen. Now her primary duties include helping around the home, caring for her younger siblings, and behaving according to cultural expectations so that she may have some chance of marrying a suitable match. Her life is that of a typical Afghan girl – but her birth defect makes it unlikely that she will be able to fulfill the expected role of a woman in her culture. When we meet Zulaikha, she is interested in learning how to read. Her mother wanted her to be literate, but she was murdered before she had a chance to pass on her knowledge. A chance encounter with one of her mother’s old friends from the university peaks Zulaikha’s curiosity, and she begins to spend some time each day practicing her reading and writing. She starts to chafe at the rigid expectations imposed by her family, and she wishes that something would come along to make her life different. When a group of American soldiers arrives in town, she gets an unusual opportunity: the soldiers offer her a free surgery to repair her cleft lip. There are some heartbreaking detours along the way, but eventually Zulaikha gets the medical attention she needs. The plotline involving Zulaikha’s surgery made me initially wary. I assumed that Reedy would depict the U.S. soldiers as heroic figures who swoop in to help this little girl, give her the surgery, and then she lives happily ever after, three cheers for the USA, etc. But Reedy made the effort to include various viewpoints that show how Afghan citizens react to U.S. military presence in their lives. Zulaikha is astonished at the rudeness of the American soldiers, especially when they greet her and her family members in ways that directly violate Afghan and Muslim customs. We hear from citizens who appreciate what the U.S. military brings to their community, and we hear from those who wish they would just leave them alone. I really appreciated the inclusion of these perspectives, as well as the fact that Reedy did not glorify the U.S. soldiers. Although Zulaikha’s birth defect is repaired and she can avoid much of the social discomfort she experienced before, life doesn’t get easier after her surgery. Her sister is married off to a much older man and experiences unspeakable tragedy. It breaks Zulaikha’s heart. After this incident leaves an indelible mark on her life, Zulaikha must decide if she will follow the expected path for Afghan women, or if she will pursue a more nontraditional lifestyle. Although Zulaikha makes some choices that go against cultural expectations, she never sways in her faith or in the values that make her such a strong young woman. I loved that this portion of the book showed how difficult it was for Zulaikha to make these choices. She didn’t just cast off everything about her family and culture in favor of new ways. She made measured, thoughtful choices to take steps toward greater independence without abandoning what defined her. Well said, Mr. Reedy. And he is backing up this statement by donating a portion of the royalties from this novel to Women for Afghan Women, an organization working to secure education and human rights for women in Afghanistan. So, although it didn’t shatter the slate, kudos to Trent Reedy for writing a book featuring such a captivating female character. Here’s hoping that we can hear more stories about Afghan girls, by Afghan girls, in the future. And I wouldn’t mind more stories from Trent Reedy, either. This is an impressive literary debut. 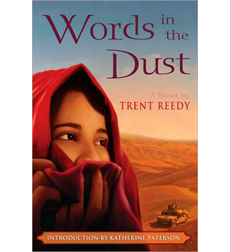 This entry was posted in Middle Grade, Reviews and tagged Afghanistan, Feminism, Trent Reedy, U.S. Military. Bookmark the permalink.